Opponents of Houston’s non-discrimination ordinance failed to gather enough valid signatures to force a repeal referendum, a state district judge ruled Friday, validating city officials’ decision to toss out the petition foes submitted last summer. See here for the background. This means that the ordinance is now officially in effect, though I presume that when the plaintiffs appeal they will ask for an injunction. Which of course I hope they don’t get, partly because they don’t deserve it and partly because the best thing that can happen now is for people to realize that the sky will not fall and the world will not end with this ordinance in effect. It’s a lot easier to scare people when there aren’t inconveniently contradictory facts on the ground. Judge Schaffer’s ruling is here. 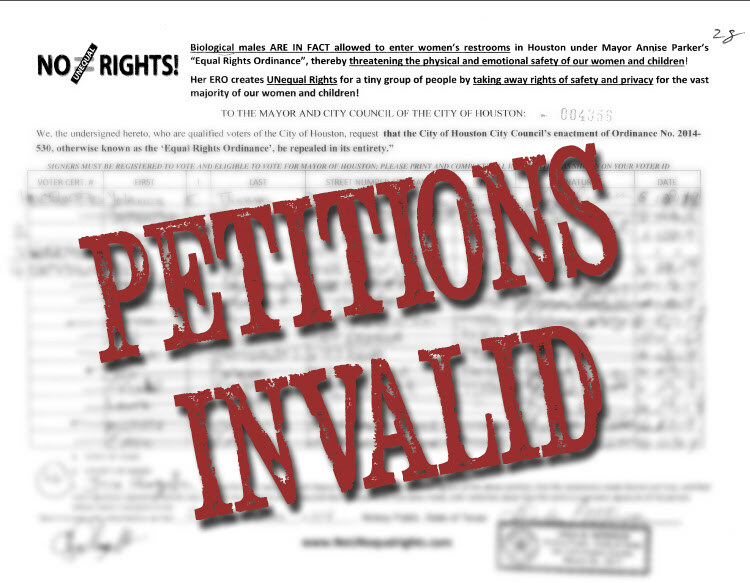 As the story notes, the plaintiffs filed last minute briefs arguing that some signatures weren’t illegible and that some people might have moved after signing the petition and thus should be counted. Here are the city’s replies on the legibility question and on the plaintiffs’ claimed count of valid signatures, which in the end was only 17,512, or less than 250 above the required threshold. HOUEquality, from whom I got all these documents, easily debunked the “some of our signers may have moved” claim. So now it will be off to the appeals courts – I gave my view of how that might play out in the first link above – and unless they prevail at a higher level, the meter is running for the plaintiffs, who were ordered to pay the city’s court costs. The clock is also running, as unless the plaintiffs get a final judgment in their favor by roughly the end of August, it will be too late to get a referendum on the ballot. I will be delighted if we never have to vote on this damned thing, but it’s too early to say that will be the case. Mayor Parker’s press release on the verdict is here, and a statement from HouEquality is beneath the fold. In a win for Houstonians, a district judge today declared that opponents of the Houston’s Equal Rights Ordinance failed to meet the minimum signature requirements for a ballot initiative. Today’s ruling is based on the jury’s verdict, which uncovered rampant forgeries, and fatal defects in the submitted petitions, as well as a recount by the City of Houston based on the verdict and judge’s ruling. Good. I really hope we don’t have to hear about the bathroom “issue” again.